HomeBlogApplicationsDigi XBee® S2C 802.15.4 – Let Your Imagination Run Wireless! Digi XBee® S2C 802.15.4 – Let Your Imagination Run Wireless! Digi XBee® is the world’s #1 RF module because our common footprint is shared across protocols and frequencies. Anything is possible with Digi XBee – from the small science project in the lab to NASA monitoring payloads on a rocket, Digi XBee gives you the tools and flexibility you need to rapidly innovate. 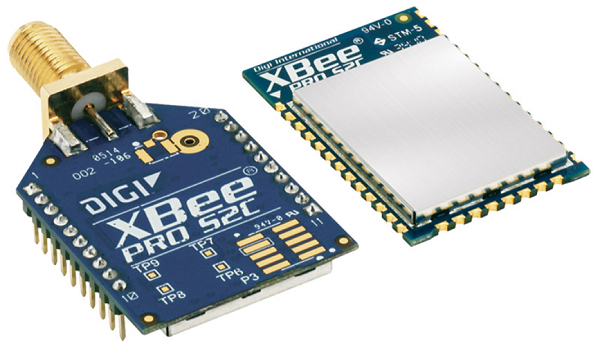 The latest example in this broad line of modules is the Digi XBee S2C 802.15.4 which is now available with the Silicon Labs Ember® EM35x transceiver. This latest module is ideal for applications requiring low latency and predictable communication timing. The Digi XBee S2C 802.15.4 is also ideal when your application requires robust multipoint wireless connectivity with reduced power consumption, support for the over-the-air firmware updates, and an upgrade path to DigiMesh® or Zigbee® Mesh protocols. Anyone deploying Digi XBee can swap one Digi XBee for another. You don’t have to design a printed circuit board to take advantage of Silicon Labs’ latest chip – Digi has done it for you on the Digi XBee platform saving you time and giving you the confidence to get connected quickly and easily. Providing quick, robust communication in point-to-point, peer-to-peer, and multipoint/star configurations, Digi XBee S2C 802.15.4 products enable robust end-point connectivity with ease. Whether deployed as a pure cable replacement for simple serial communication, or as part of a more complex hub-and-spoke network of sensors, Digi XBee 802.15.4 modules maximize performance and ease of development. Digi XBee is a special product because of our customers: the innovators, the hackers, the problem-solvers — whatever you call yourself, Digi is dedicated to providing you with everything you need to quickly create wireless connectivity solutions. Let your imagination run wireless!